Great snack for everyone, or the for kids lunches or even as an after school treat! Serve for breakfast with yogurt and fruit or over ice cream for dessert. Position rack to middle of oven and preheat to 300*. Lightly spray large baking sheet with nonstick spray. Mix next 5 ingredients in large bowl. combine oil, honey and sugar in small saucepan; bring to simmer over medium heat. Pour hot liquid over oat mixture; stir well. Using hands, toss mixture until thoroughly mixed. 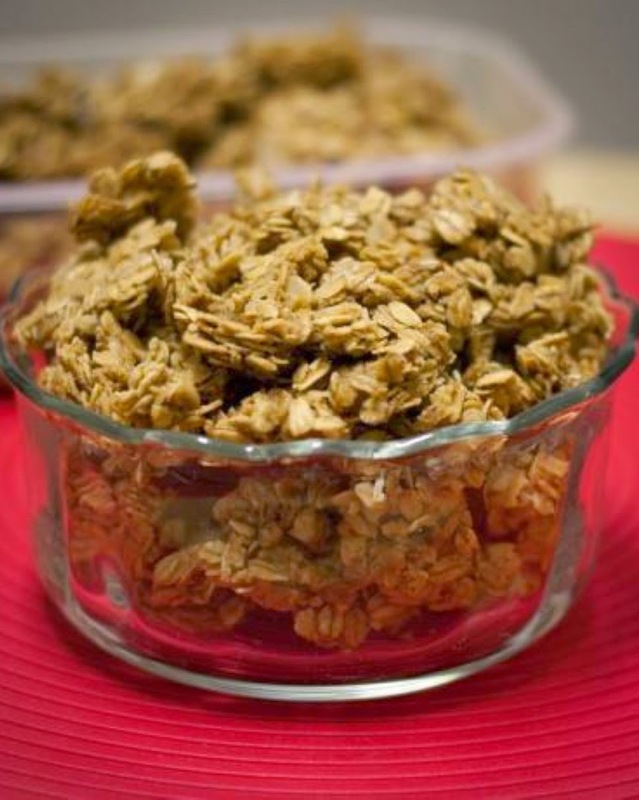 Spread granola on prepared baking sheet. Bake until golden brown, stirring occasionaly, about 30 minutes (but check after 20). Transfer sheet to rack; cool granola completely. (Can be made two weeks ahead. Store in airtight container at room temperature.) Makes about 8 cups.